The Cover-Pin by Kandinsky, which was distinguished in the category Give-aways, puts an end to unsightly holes in clothes. 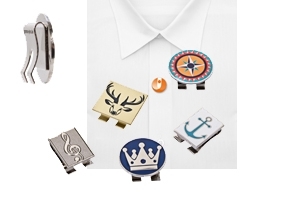 Whether for a customer call, promotion campaign or trade fair appearance – equipped with the accessory of the Düsseldorf-based company a shirt, blouse or polo shirt can be decorated in CI look at the flick of a wrist. The patented brand ambassador has an individual customising surface attached to a clip. The clip simply has to be pushed open to attach it to a buttonhole on sleeves or the button panel – this is a fast and simple way of ensuring that the logo or motif are in view. To enable a maximum amount of individualising flexibility the innovative promotional pin can be made in special shapes as well as in the desired pantone shade and among others customised using the enamelling (soft-cloisonné), soft enamel, offset printing and relief embossing processes.